Since the 4th of October 1945 (04/10/1945) the 113 Squadron had ceased to exist when inexplicably it was resurrected from obscurity with the remnants of 620 Squadron at Aqir Palestine on 1st. September 1946 (01/09/1946). The irony is that this resurrection occured in Palestine, This was the country of the 113 Squadrons birth back in 1917 during WW1. Edward Gunn, who was one of those that made the transition explains: I was a navigator with 113 Squadron at Aqir in Palestine when it was reformed in September 1946. This resulted from the depletion of personnel from 644 Squadron at Qastina and 620 Squadron at Aqir due to demobilisation. I was originally posted to Qastina when 644 Squadron moved there from Tarrant Rushton in December 1946 with our C.O. Wing Commander Ingle. The C.O. appointed to command 113 at Aqir was Wing Commander Alexander. Here the revived squadron carried out transport duties using Douglas Dakotas and a late version of the Handley Page Halifax. This period however was far from simple transport chores. The political scene In Palestine was once again getting hot, and once again the 113 was in the thick of it. In February 1947 following escalating political unrest all non-essential civilians were ordered to be evacuated from Palestine. This grand scheme was code named (Operation Polly) and the 113 Squadron flying Handley Page Halifax A9 transport aircraft rounded up a total of 508 passengers and evacuated them to Egypt within two days. Amazingly, scarcely a month after the 113 Squadron disbanded in Palestine it reformed in a similar role at Fairford, Gloucester in the UK on 1 May 1947. Although details of actual operations are sketchy, it is know to have been engaged in transport duties, once again flying Halifax's and travelling as far afield as Istnes (Masrseilles) Castle Benito (Tripoli) and Fayid (Canal Zone). Sometimes aircraft would carry supplies to these RAF stations attached in the panels under the fuselage. 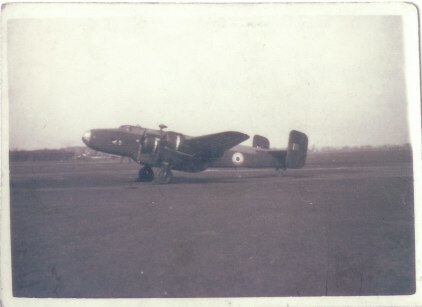 In addition to transport duties most of the local flying in daytime involved the Halifaxes towing Hamilca and Horsa gliders to train glider pilots. The aircraft would takeoff towing the gliders, do a circuit and while over the airfield the glider pilot would release the tow rope, the aircraft would make another circuit and then drop the rope. Then the glider would land. LAC Glen Thomas gives some insight into this period: 113 was one of four squadrons at Fairford in 1948, all four were in dispersals around the airfield with spaces for 6 Halifaxes at each dispersal. 113 was situated at the Eastern side of the airfield practically opposite the Control Tower and the one maintenance hangar. In 113 we had 6 aircraft with the letters H, J, K, L, M, N. The C.O at the time was S/Ldr Stephenson. Our billets were quite a distance from the airfield by the side of the road leading down to Fairford village. Without exception the billets were Nissan huts as well as the Officers, Sgt's and Airmens mess, the NAFFI and the office building. Some of these exercises were massive in scope as LAC Glen Thomas explains: There was one incident that stands out in my memory. It was a beautifull May evening that 2 or 3 of 113's Halifax's joined with others from the other squadrons as well as 6 or 7 Dakotas from another airfield and we were all assembled on the threshold of the main runway. Some of the Halifax's had gliders attached to them with taut tow ropes, some had a gun and jeep attached slung under the fuselage, others with what looked like equipment boxes, and I seem to recall that the Dakota's were laden with airborne troops. Each aircraft was positioned for early takeoff the next morning. The strange thing is that I can recall all that evenings preparations, but just can not recall what must have been an impressive mass takeoff the next morning. I do recall someone saying that this was all just part of a mass exercise on Salsbury Plain. The life of 113 Squadron ended once again, now for the fourth time, on the 1st. September 1948. 113 was resurrected yet again at Mepal on 22nd July 1959 as a Thor intermediate range ballistic missile (IRBM) squadron equiped with 3 Thor launchers. Mepal airfield was built to Class A specification as one of the two satellite stations for the Waterbeach cluster. The site on a 20-foot rise out of the Cambridgeshire fens, was confined by the New and Old Bedford Rivers to the west; the villages of Sutton to the south, Mepal to the north and Witcham due east. Officially opened in June 1943, its first occupants were the Stirlings of No. 75 Squadron which saw out the war from Mepal. After 75 Squadron moved out in July 1945 they were replaced by 7 Squadron, 44 (briefly) and 49 Squadron. The contraction of the RAF during the first year of peace resulted in several stations becoming available with better accommodation than the `nissan huts' at Mepal, and in July 1946 the Squadrons moved on leaving the base without active units for 12 years. On 10th. July 1963 the 113 ceased to exist, possibly forever. However, the Squadron and all the men and women who served on it have earned their place in history and leave us a legacy that all succeeding generations can be fiercly proud of. No other RAF Squadron can boast to have served in as many different capacities or in as many different theaters. The many who died serving with the squadron will live on in our memory forever. Generation after generation we will keep their memory alive, we will never forget.